In some cases, however, DIY is necessary and the only option. Consider for example couples who are going through divorce and simply don’t have the financial means to get professional assistance. They are reliant upon DIY divorce documents and are faced with navigating complicated legal issues reduced to fill-in-the-blank forms. It’s a means to an end, albeit less than ideal. Then there are others who pursue DIY divorce documents simply as a way of saving money – a noble thought, but possibly leaden with issues. My client and his ex-wife, both very intelligent and educated individuals, made sure to get a mediator involved in their divorce to negotiate their financial settlement (which was a very lopsided settlement with my client taking the hit because a CDFA® wasn’t consulted…but I digress), but left their parenting plan to themselves and a fill-in-the-blank parenting plan. They figured they could save some money and were still in the cooperative phase of their divorce, so it seemed to make sense. The financial piece was the hard part but doing what was in the best interest of their children seemed like it was easy! What they ended up with was a parenting plan that was vague, incomplete, and in some cases downright stupid. Neither had any knowledge of the legal implications contained in that document. And while the parenting plan initially worked, once my client got engaged, their co-parenting relationship took a turn for the worse and endless arguments erupted regarding parenting their children. “The minor children will be in the care of Father as follows: on nights that Mother is on-call and six other days/nights of the month. The minor children will be in the care of Mother as follows: whenever the are not in the care of their Father.” This dandy arrangement resulted in my client knowing when he’d have parenting time only one month at a time. His ex-wife eventually demanded control over and weaponized the creation the calendar, often providing it to him the last day of the proceeding month despite her knowing her call schedule typically six months in advance. For years, my client couldn’t book travel or buy tickets to a concert or show in advance for fear that it would interfere with the calendar and he would lose parenting time. “Both parents will make major educational and medical decisions together…If the parents do not reach an agreement then: Mother will make decision.” My client failed to understand that by his ex-wife putting a checkmark in the optional election for one parent to make final decisions that he had given her superior decision-making authority. She held this authority over his head any time they were contemplating a major decision with the children, stating that while she’d listen to his input, she’d ultimately make the decision. This left my client feeling helpless and basically stripped of his parental rights. My client and his ex-wife ultimately ended up hiring attorneys and going to court to hash out a more reasonable and enforceable parenting plan. Sadly, his ex-wife was unwilling to give up her superior decision-making authority, and it haunts my client to this day. In the end, they ended up paying thousands of dollars to fix their DIY parenting plan. So much for saving money, right?! Let my client’s story be a lesson to you. If you’re considering divorce or are in the process of divorce, get the right professionals involved to help you navigate the process. At Smarter Divorce Solutions, we work with couples to create a plan that is fair and functional, and we can draft your divorce documents to make sure your plan is well documented. Give us a call to learn more – we’re happy to help! 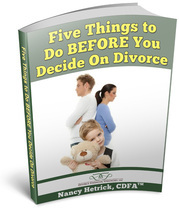 ← How Much Divorce Settlement is Enough?